But i digress. 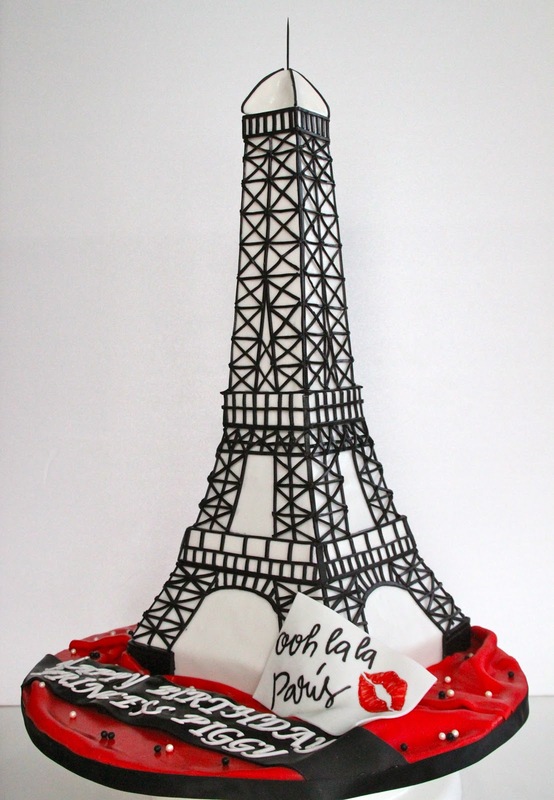 R told us his wife has been badgering him, hoping to fly to Paris or Hokkaido soon, and asked if we could think of something along those lines for his wifey. 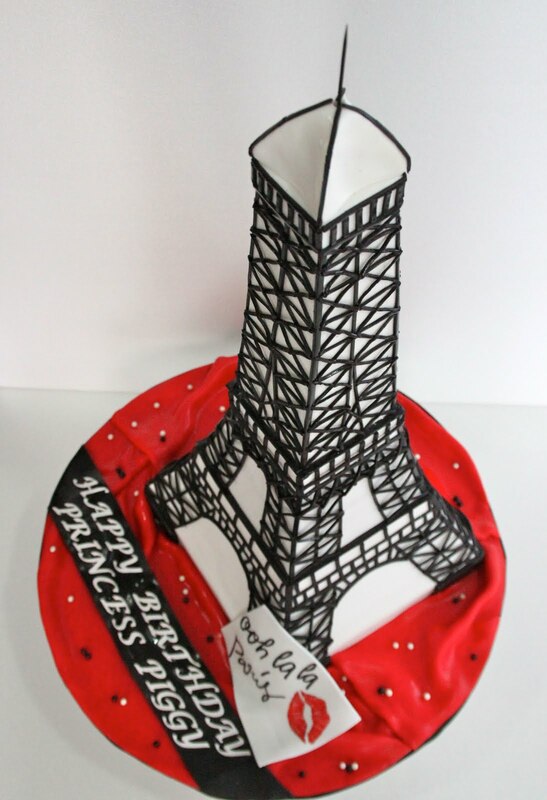 We suggested the Eiffel Tower in cake since it is the icon of Paris. We laid our groundwork by first proportionately scaling down the actual height of the tower to fit the serving size and cake board. But i think we were too preoccupied in trying to keep the upper quarter of the cake stable that we shaved off a bit too much of the peak, so the entire cake looks a tad stunted. next time we get a chance to do this cake again, i'm gonna make sure that it is slender at its peak. This cake looks straightforward enough to do, but my goodness, the grids of the Eiffel took me an entire day to complete. Every single black line you see on the tower is hand rolled, cut and stuck on manually. it was monotonous but bloody time consuming. All in all, i think this cake still looked impressive, despite the fact that it is a bit fat and unshapely. it will be better the next time round! Cake was chocolate cake with lemon filling. This is beautiful! Maybe you can try using black royal icing instead, it might be quicker! Thank you so much for baking such a beautiful cake for me! Love it loads and everyone's very very impressed! My aunt even asked my uncle for an MBS cake on her birthday! LOL! Glad that you liked your cake. 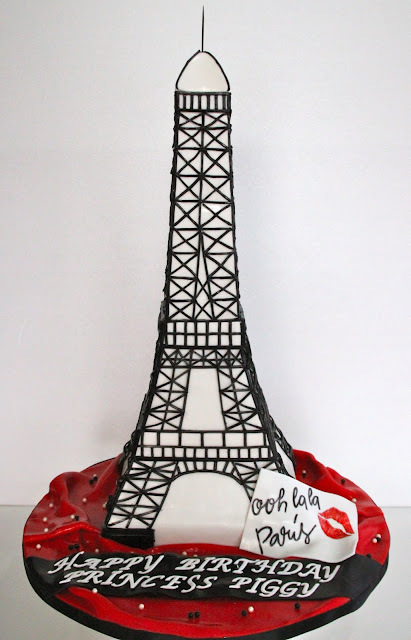 Rowan gave a lot of thought to the design of your cake before deciding on one to remind you of your favorite place. I'll definately be getting this for my 21st! hello:) this is amazing! I was wondering how you got the fondant on? did you use one large piece or several smaller ones? thank you! wonderful job!